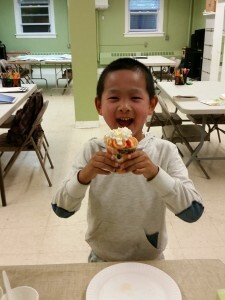 At Lin Learning Center, we provide safe and high quality nurturing after school care for children from grades 1 to 5. 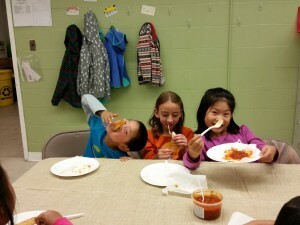 We believe in giving children the practical knowledge of what they already studied in schools right here in Brookline. Topics are students initiated and subjects matter are explored through experiments, cooking, art work etc. Our little scientists did not stop at just one, but two tests! Yes, they loved apples so much that all test subjects were eaten. You’ll be interested to learn the methodology and result. As usual, remember to check out joyful pictures of children hands-on making and eating daily snacks. As Fall rolls around, apple is the seasonal fruit with many varieties available for us to eat. It also has its wide range of benefits. Since at Lin Learning Center, we spend a lot of time preparing snack and eating daily and healthy, it is one of our interest to know which apple is our favorite. We decided to make it fun for children and take on the project of answering question how do we decide on which apple to use for our snack. Fuji, Macintosh, Ambrosia, Granny Smith, Braeburn, Red Delicious, Gala, and Honey Crisp, which are commonly sold at the local market. Anna mentioned that Ambrosia, Gala, and Fuji have soft pinkish red color and stripped look to them. Vera said, “I know this is Gala because it’s the only apple with dots”. Josie mentioned that the Red Delicious and Macintosh had the most intense red. Just as apples come in many different shapes and colors, children also noted that inside of the apple does not have the same yellow color tone. This is when we bring math and statistics into play. We all know, how bored children get with the typical math word problems in their school books. But with this technique, it was all fun and game. And the best part? They learned it with just happiness on their faces. So what did we do? 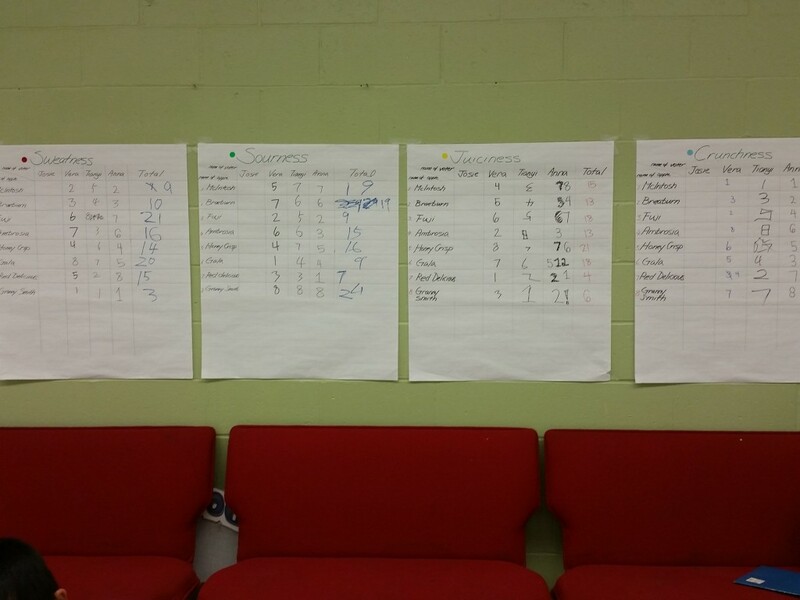 First, we collected taste testing data by grading which apple is children’s favorite to least favorite. The highest score of 8 being the most favorite apple and 1 being the least. Each child carefully tasted apple and sometimes with repeated trial. 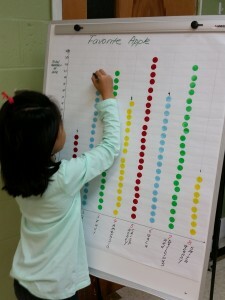 Once each child scored the apples, we looked at the chart together to see which apple got the highest score. 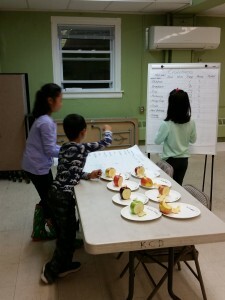 One child suggested, “… add all the score to get the total score for the each apple”. 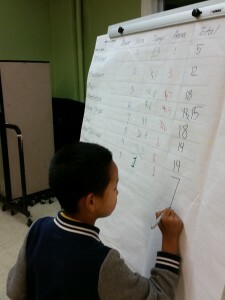 Everyone took part in adding the total scores to see which apple was voted the most favorite. 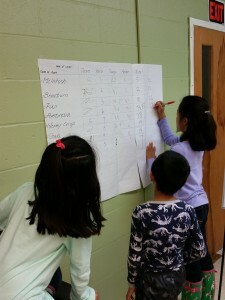 Children were so interested in finding out whether their favorite was the voted the most favorite. They even chanted for their favorite apple. According to our vote result, the winner of this round was Honey Crisp. To explore further, this data was drawn out to make graph to visually show the most favorite to least favorite. However, as the total score was plotted on the graph and examined, we realized that this information did not give more than what’s our favorite or least favorite. So, we decided to find out the reason of what characteristic makes apple one’s favorite apple. 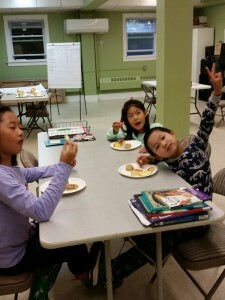 Children agreed on sweetness, sourness, juiciness, crunchiness and smell. 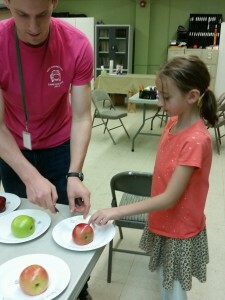 We performed another apple taste testing with four characteristics. They were over-joyous. 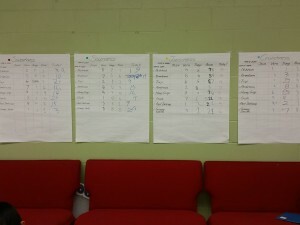 Additional data and graphs gave us more insights. Tianyi said “look” pointing at the Granny Smith sweetness and sourness result. Granny Smith sweetness was scored one, one, and one, total score of 3. While the sourness was scored three, three and three, total score of 24. Everyone laughed. 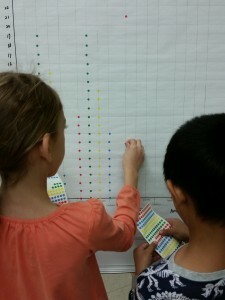 In addition, children realized that sweetness and sourness scores have opposite relationship. Conclusion: We found that Honey Crisp has well balanced sweetness and sourness while having superior juiciness and crunchiness compared to other apples. Despite many weeks of eating, analyzing the taste and grading the taste and generating charts and graphs, children were very happy to engage in the project. Except for Macintosh and Granny Smith, we always run out of apple at the end of the day. After three weeks, we are able to find our favorite apple and conclude our reason for picking it.